Rare Royal Hojari Frankincense Essential Oil, also known as Silver Frankincense, is distilled from an exclusive quality of Frankincense tears that are usually reserved for royalty and celebrated leaders. This strain of frankincense has its roots in over five millennia of human history. Anointed and inhaled by shamans and royalty in spiritual ceremonies for thousands of years, this fine, fragrant oil fortifies and energizes as it nestles the nerves, deepens breathing during meditation, and increases the intuition of our inner guidance. Holding the wisdom of the ages, Royal Hojari Frankincense is a formidable essence for supreme skincare and deep spiritual practices. Earn up to 161 Points. 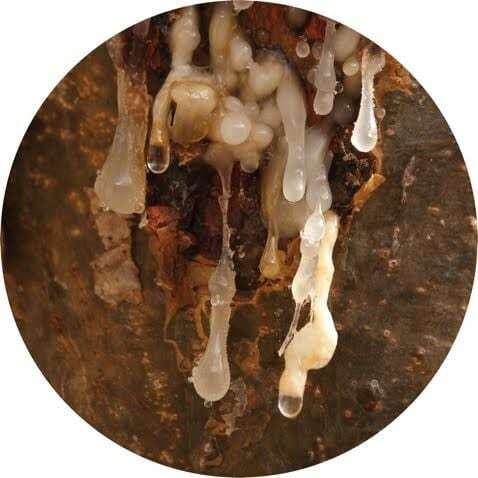 Royal Hojari Frankincense is distilled from large, white frankincense tears harvested from wild frankincense trees in the mountainous region of Oman only in the fall after the summer rains. This quintessential essence is distilled slowly in copper alembics for a lovely, silvery clear oil with a complex and delicate aroma that cultivates reverence. In Biblical times, this essence was purchased at the port of Samaram at the same price as gold and myrrh and traded as a precious commodity along the Silk Road. Sweet, resinous-roots with a clarifying balsamic undertone. Grapefruit, Rose Otto, Fragonia, Marjoram, Firs, Myrrh, Spruce, Seabuckthorn, Immortelle, Ylang, Sandalwood, Palo Santo, Bergamot, Myrrh, Sweet Thyme, Silver Fir, Oregano, Lemon Myrtle, Clary Sage, Desert Sage, and Chamomile. While every type of frankincense is fortifying and beautiful for skin and oral care, divine in diffusers, salt pipes and focusing in meditation, Royal Hojari Frankincense’s supreme quality especially excels in mind, meditation, and spirit care. It is also makes a regal perfume. “Frankincense operates by inducing the state of focused contemplation necessary for aspiration to the divine, to the spirit.